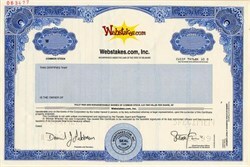 Beautiful engraved RARE specimen certificate from the Webstakes.Com, Inc dated in 1999. This historic document was printed by United States Banknote Company and has an ornate border around it with a vignette of the company logo. This item has the printed signatures of the Company's President, Steven H. Krein and Secretary and is over 8 years old. This is the only certificate we have seen from this company. How much is a good name worth? The answer seems to be "a lot" for Webstakes (Nasdaq: IWIN). 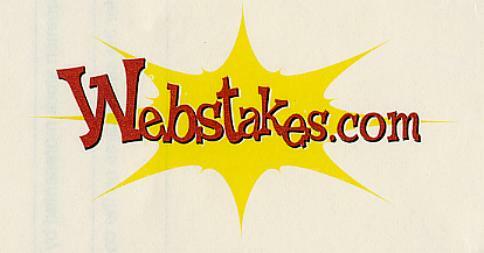 Shares of Webstakes rocketed more than 17 percent on Monday, gaining 3-5/16 to 22-5/16 after the company announced that it is changing its name to Promotions.com. On Wednesday, the company's Nasdaq ticker symbol will change to PRMO. "The name change was necessary to clarify that our company is a business-to-business solutions provider, not a business-to-consumer Web site," said Steven H. Krein, chairman and CEO of Promotions.com. This kind of distinction is important because investors are losing patience with many business-to-consumer companies. Also on Monday, Promotions.com announced Promotions.com Direct, an e-mail marketing solution for online and offline businesses. Customers include AltaVista, BellSouth, ESPN.com and Hewlett-Packard.